Happy Holidays and Season’s Greetings. It is the time of year to be merry and, if you are able to, splurge on your kitty. One of the best ways to do that is to get your kitty something that will help fight boredom and unwanted behavior while you’re out and about the rest of the year. Lavish them with a few gifts that can help keep them busy while you’re at work. Here are a few presents that cats can enjoy whether you’re home or not! 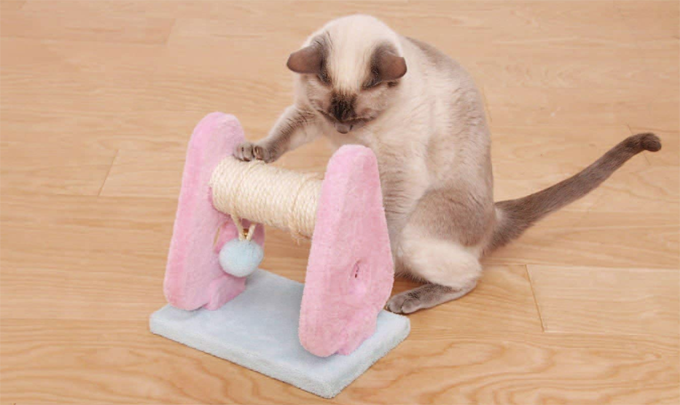 Check out this cardboard scratcher cat track toy. Give your cat something to deter them from going to town on your furniture. With a little catnip, they will be drawn to it like bees to honey. The mouse is bound to give them some added fun! 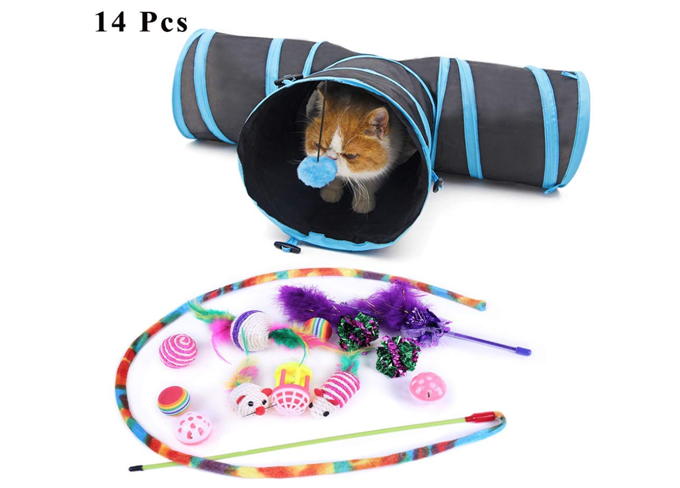 This 14 piece set comes with a 3 way tunnel, teaser wands and lots of little fluff ball toys. 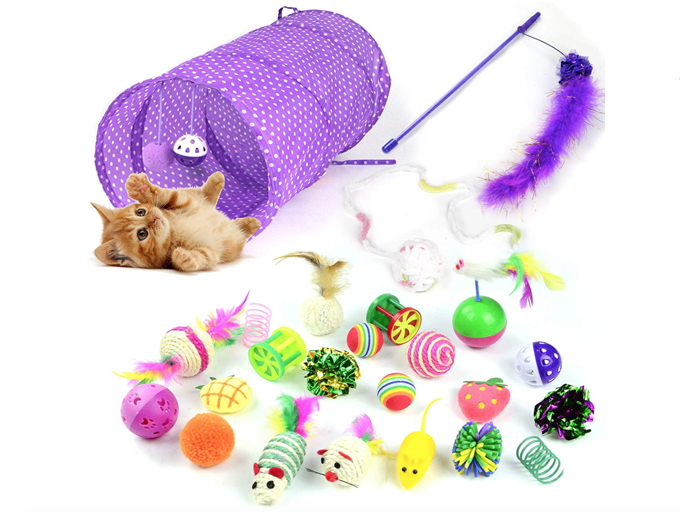 This assortment is sure to keep your kitty cats busy playing. The tunnel can fold down in seconds and is easy to store! “OMG!” is what your cat will think when they see this Christmas morning with a bow on it. The real trick will be assembling it without them seeing if you want them to have a surprise. Though for some reason, when I’m assembling something, my pets all gather around and watch as if they are about to witness the first moon landing. Letting your cat watch you put it together just might be bonus fun! I actually would like to get this for myself. Something tells me that if I got this for myself, my cats would enjoy it just a little bit more. 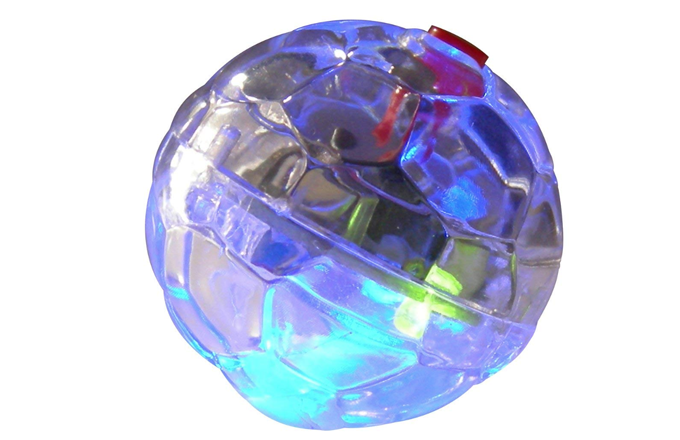 This motion activated light up ball is a beautiful way to brighten the holidays. So pretty! 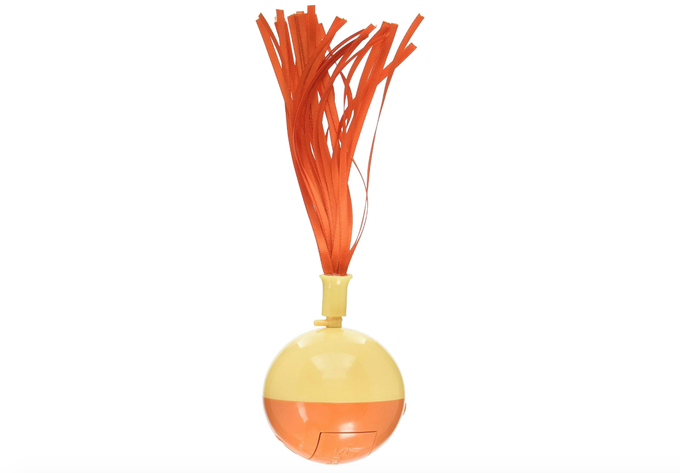 If your cat likes to hunt, they will have fun trying to catch the fast moving balls! 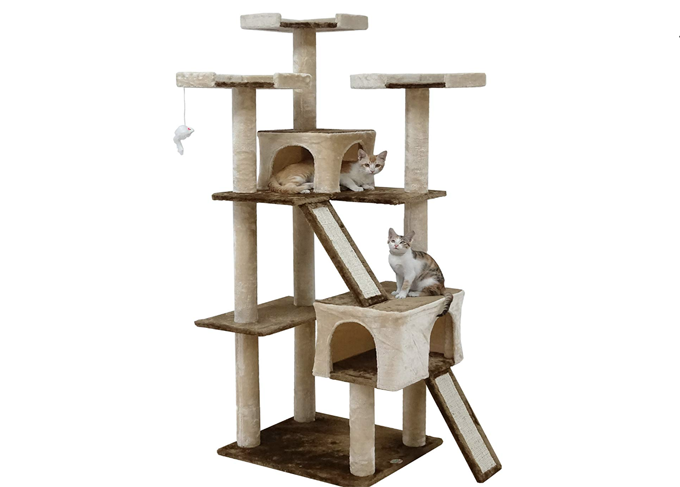 It’s excellent for single cats or multiple cat households and made with environmentally-friendly materials. 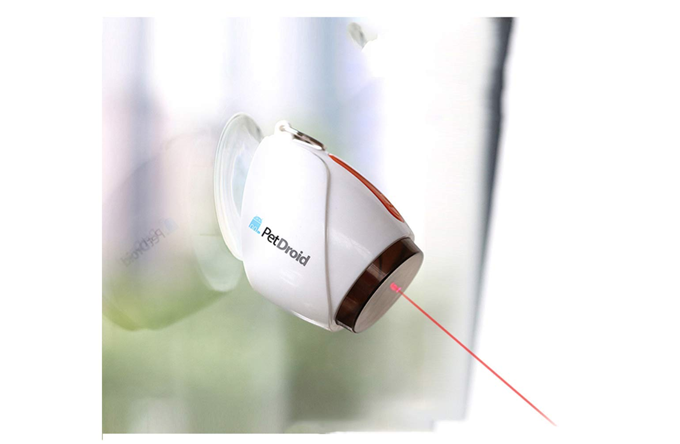 The laser moves randomly across your floors and walls and appeals to the hunter instincts in your cat. It shuts off after 10 minutes to prevent over-stimulation, which means your kitties will never get sick of it! Cats can rub against this and get in a good massage. This will give them one more way to do their favorite thing–groom and look pretty. I wish they made something like this for humans. This appeals to your cats vanity and desire to look adorable at all times. Do not let them down. 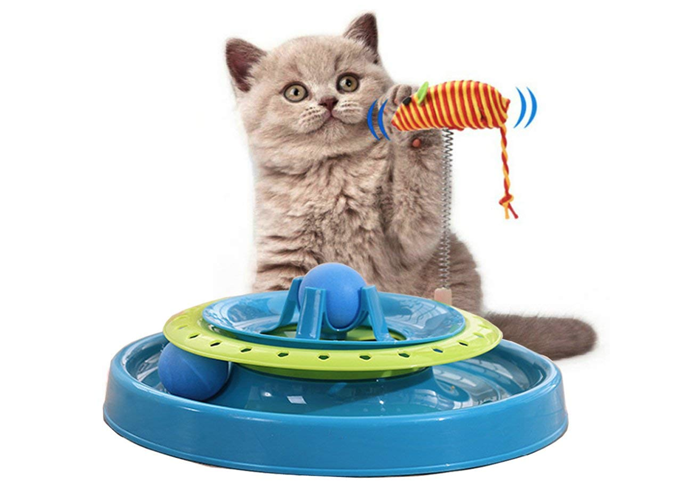 This small design is ideal for kittens who are just learning how to scratch! 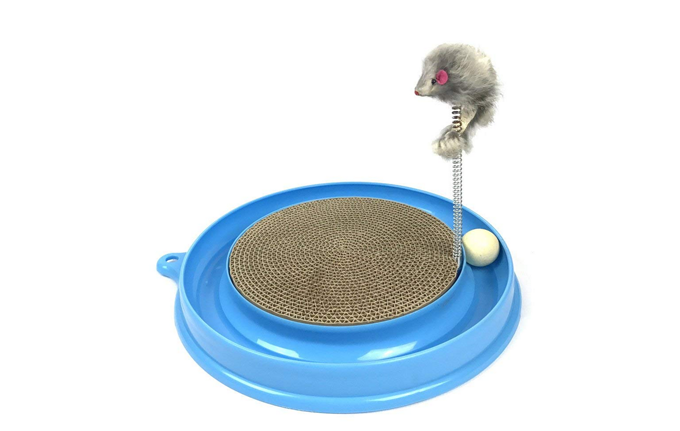 The hanging ball will draw the kitten in, and before they know it, they are scratching away or batting the ball around. Surprise your kitten Christmas morning with this under the tree! The look on their face will be priceless! This variety pack will keep your cat or kitten busy for a few minutes before moving on to the next toy! 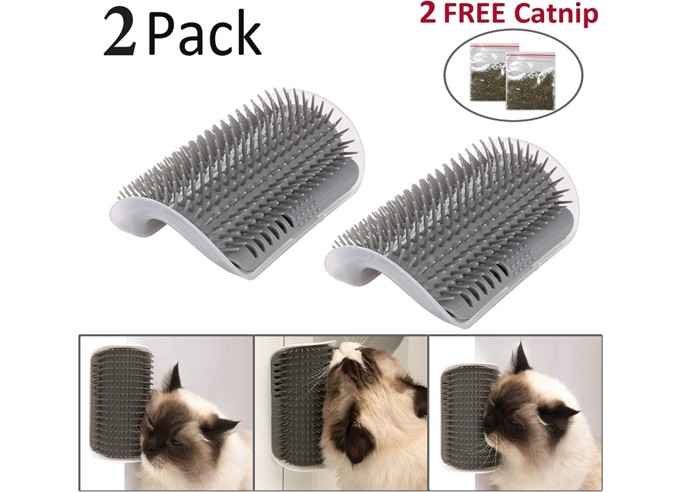 Your cat will get some stimulation to get them through the long days home alone. Feeding your cat is not enough. If your cat is home while you’re at work, make sure your kitty gets in some stimulation through the day. Whether it’s homemade toys or things you bought. Cats need to play and do silly little cat activities to thrive in this world. How do you keep your cat busy while you’re at work? Please share your thoughts in the comments below! We want to hear from you.